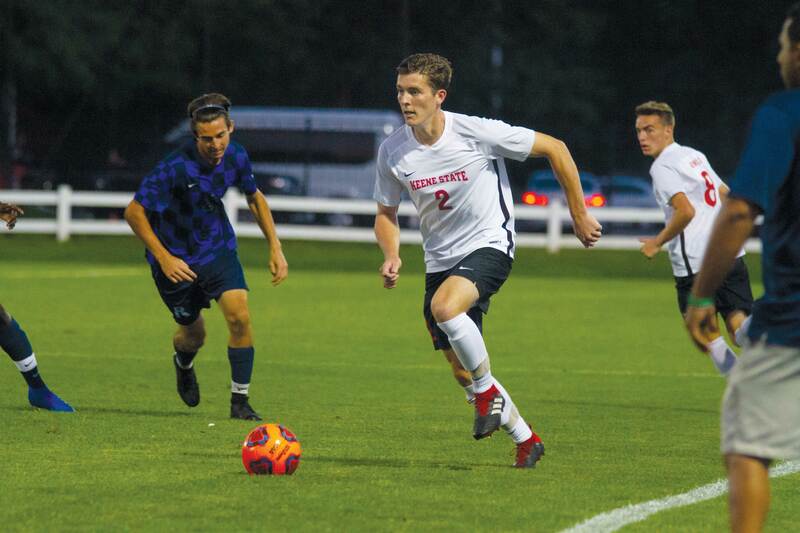 The Keene State Men’s Soccer team is predicted to place 5th in the Little East Conference (LEC), according to a preseason poll voted on by the coaches in the league. KSC Men’s Soccer Head Coach Rick Scott said, to qualify for the LECs, the team must place at least sixth in the league. The LEC is made up of nine teams. The top six teams in the league play in the LEC tournament and the winner is declared the LEC Champion. The winner then moves on to the NCAA tournament to play Division III teams across the country. This year’s team lost ten seniors from last season, along with 5 to 6 players who did not return to play in 2018, Scott said. The team has welcomed 24 freshmen. With such a young team, Scott said with time, players will adapt to the college-level competition and grow from their practice on the field. “Right now we’re getting an awful lot of scoring opportunities and we’re not putting them away. I think that will come with experience because with experience will come the composure down in the area in the box. As we get more experience I think we’ll start putting our chances away” he added. Overall, Scott said he believes this team has great potential and he sees the team dynamic is growing stronger over the course of the season. “I think we’re becoming an exciting team to watch. It’s a very hard working team. We seem to have some very good chemistry. The freshmen came in working hard from day one. Every single day we get a little bit better. The chemistry gets stronger, and for me chemistry is critical,” he said. Right Midfielder and KSC Junior, LJ Luster, said the goals of the season are to win the Little East Conference and make it to the NCAA tournament. According to Luster, the team’s biggest competition is University of Massachusetts Boston and last year’s LEC title winner, Western Connecticut. Luster was surprised to lose a large number of teammates in the 2018 season, but he doesn’t see that negatively impacting the team. “It was a shock to lose that many people, but we’re building as a team. We’re just as good as we were. We have a lot of really good young players who are stepping up. The incoming freshmen are a great group of kids. They’re strong and passionate about our sport,” he said. Luster continued by saying the pre-season poll doesn’t represent the team’s potential and many teams underestimate them due to minimal amount of upperclassmen. “I think it’s kind of a slap in the face, I think we’re a lot better than that. A lot of team rate us as the underdogs and that’s fine. It only makes us play better,” he added. KSC Sophomore Defender, Isiah Lovering scored two goals in Tuesday’s match on Sept. 4 versus Rivier. Lovering said the team has good chemistry which will help them during the season. “We have a core group of veterans that are really close and I think the team dynamic with the freshmen coming in, even though there’s a lot of them, it works well, and it helps us play better together,” he said. Lovering continued by saying he expects his team to quality for the LEC tournament due to their drive and passion. “We’ll definitely make the playoffs, which is the top 4 teams. I have faith in the team for that and when it’s playoff time, anything can happen. It just come down to whoever wants it more and I think we could make a run,” he added. According to Lovering, the LEC is always tough, but his team is ready to take on the league, even if they are labeled the underdogs. “Coach has already told us he talked to some other coaches and they’ve been underestimating us. They aren’t really circling our name on the schedule, but they should be,” he said. This Saturday, Sept. 15 the Men’s Soccer team will take on, Eastern Connecticut State, their first LEC team of the season. The game with played at KSC with kickoff starting at 7 p.m.